iRealHousewives | The 411 On American + International Real Housewives: Eileen Davidson Nominated For ‘Outstanding Lead Actress In A Drama Series’ At 45th Annual Daytime Emmy Awards! The nominations for the 45th annual Daytime Emmy Awards were announced on March 21, 2018, during an episode of The Talk where Real Housewives of Beverly Hills alum Eileen Davidson has been nominated for "Outstanding Lead Actress in a Drama Series" for her role as Ashley Abbott on CBS's The Young and the Restless. Competing in the same category with Eileen are Nancy Lee Grahn (General Hospital), Marci Miller (Days of our Lives), Maura West (General Hospital) and Laura Wright (General Hospital). 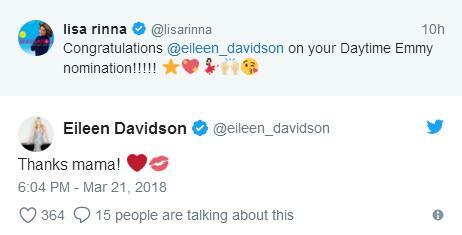 Davidson took to Twitter to congratulate the other nominees. "congratulations ladies! Thrilled to be a part of this fantastically talented group! ❤️❤️❤️," she tweeted. 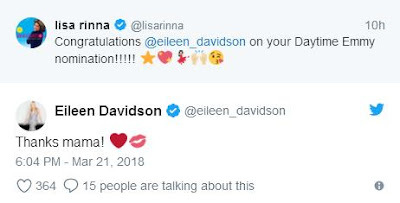 Lisa Rinna took to Twitter to congratulate Davidson for her Emmy nomination, "Congratulations @eileen_davidson on your Daytime Emmy nomination!!!! !," which Davidson replied, "Thanks mama!" In 2014, Eileen won the Daytime Emmy for Outstanding Lead Actress in a Drama Series for her as Kristen DiMera role as in Days of Our Lives. This year’s Daytime Emmys will be hosted by Mario Lopez & Sheryl Underwood to Host and the event will be held Sunday, April 29 at the Pasadena Civic Auditorium in Southern California, and live-streamed via Facebook, Twitter and the Daytime Emmys website; the Creative Arts ceremony takes place the Friday prior. Veteran actors Bill Hayes and Susan Seaforth Hayes, as well as producers Sid and Marty Krofft, will be honored with Lifetime Achievement Awards this year, according to TVLine. CLICK HERE to view the complete list of categories and nominees!